We were asked to develop a dinner inspired by the brain for a project devised by the science event group, Guerilla Science. Over three days in March, a World War II bunker under Dalston was transformed into an architectural model of the brain. The eerie chambers were filled with sculptural installations, and experiments and memory tests were performed on the guests. We served five courses, interspersed with lectures from neuroscientists and psychologists who explained the processes of the brain, synaesthesia and memory. In the months leading up to the dinners, we spent some time visiting and cooking with members of Headway East London, a charity which supports survivors of brain injuries. Chatting with them, we were able to gain some understanding of how the brain reacts to head injury, particularly in the context of the senses and perception of taste. 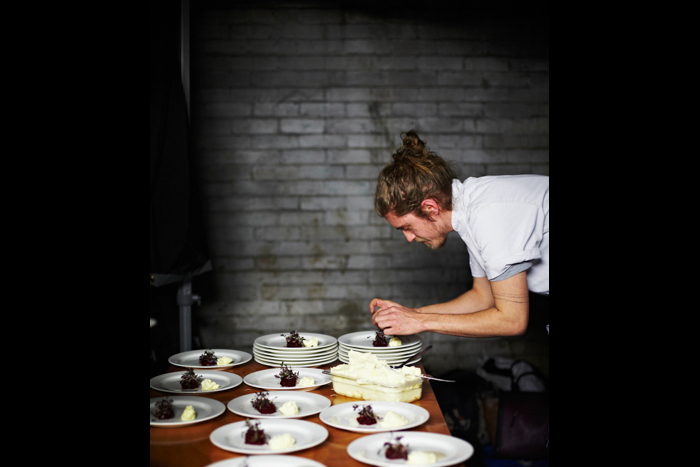 The five-course menu started with a course representing the popular notion of ‘brain food’ - an emulsion of pilchards, gluten-free seeded bread, roasted buckwheat grains, beet chutney and cultured butter. Next was a course of white and green ingredients, onto which were projected green and blue spotlights as the course progressed, playing with the guests’ perception of the palatability of the food. Based on a favourite lunch of egg and chips served at Headway East, we made a rich ham broth, in which we served a slow-cooked egg yolk and spring onions, accompanied by a huge potato crisp. We aimed to serve a familiar dish with atypical textures, in reference to the altered senses that can result from head injury. The main course was half a calf brain, fried in cultured butter and served with a salad of burnt brassicas, fermented green elderberries and toasted walnuts. The effect of eating a brain while listening to explanations of its mechanics while sitting in a dark bunker was a little challenging for some guests, but most understood our attempt to show the use of a brain in a culinary light. The final course, relating to a memory of the smell of cut grass in the summer, was a cheesecake perfumed with wild herbs and spices containing the aromatic compound coumarin - tonka beans, sweet clover and scented mayweed. To read more about the project and the dinner, head to the Guerilla Science blog for posts by Ben Graham of Headway East London, Jen Wong from Guerilla Science, and Josh.